The plant strong scene for dining in Ubud, Bali is growing by the month and this mountain village is beginning to set itself apart as a raw food mecca. Very happy with the choices in past trips I was astounded to discover a few more new ones and several more well established restaurants with abundant vegan/vegetarian options. The staffs were also happy to suggest menu items if my choices weren't obvious. A welcome dining scene is flourishing and I couldn't be happier. Here are just a few within walking distance from my hotel on Monkey Forest in downtown Ubud. Most all of them offering vegan raw and cooked items I give them all Five Stars on the RC Raw on the Road Restaurant Scale of approval. A bit off the beaten track and out of the center of Ubud, one of the newest additions to the healthy food scene here is one of my best finds. I made the trek to discover a thriving spot with a simple menu -- juice and salad bars. Numerous fresh juices and a well stocked salad bar what more could you want. But the best discovery was a small sign saying "we deliver." Most of the cafes do deliver to the surrounding area but Alchemy is the ONLY one offering delivery of their fresh juices and many kinds on a daily basis. A fair price, juiced first thing each morning they provide a wonderful service to the casual juice lover or those who choose a juice cleanse while here on holidays. I took advantage of their juice delivery service and couldn't have been happier. Also offering colonics, acupuncture and a small array of healthy products it's a must stop (or at least call and set up a delivery) for those wanting to start their day the healthy way. Our More than a Nut Milk Bags are offered here at Alchemy. 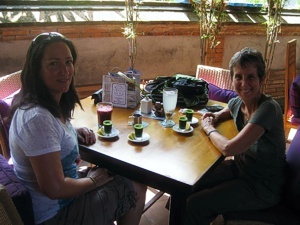 The classic Ubud hangout -- everyone knows about Bali Buda. The store has supplies and prepared foods for everyone and the restaurant upstairs highlights a varied menu from wheatgrass shots and veggie drinks to full entrees and creative desserts. I'm particularly fond of the spirulina balls at the store and always stop to pick some up early in my visit. A new one when I visited in 2010, the stunning atmosphere and the creative, extensive menu with everything from drinks to desserts is worth a stop anytime. You'll know they are open by the well organized shoes at the entrance. New since I last visited is the next door store front they've opened -- Clear Cafe Express. Numerous dried foods packaged for your snacking pleasure be sure to stop by to stock up for hiking, yoga, beach combing or those long shopping days ahead. Sadly November 20, 2014 the café burned completely to the ground. No one was hurt and they plan to rebuild but the loss of this favorite of mine and so many from around the world will be felt for many years to come. The Ubud cafe opened after successful ventures in Sanur and Seminyak both beach towns near the airport. Menus are the same at each of the three cafes with outstanding choices for vegan raw or cooked items. Each cafe offers a well-stocked store of healthy products for your kitchen, bath or home. The newest surprise is the opening of Cinema Paradiso, next door to the Ubud location in early 2014. Offering movies every night of the week they cater to every audience and post the schedule outside the café and on their Facebook page. A stunning sustainable resort located 20 minutes outside Ubud in the bucolic rice field countryside. The restaurant onsite offers some of the most exquisite food I've ever had AND it's plant strong. Offering a vegan raw menu for guests staying at the resort on holiday it's worth the drive to visit the grounds of this award winning spa and enjoy the creativity of Chef Made Runatha. I admit I might be a bit biased, Made and I have worked together and are good friends, but I am blown away by his creations every time I have the privilege to dine with him. 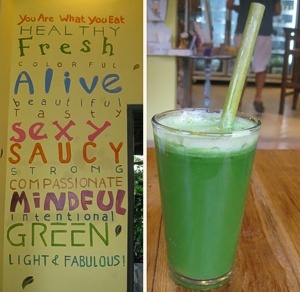 Vegetarian, vegan, nut and gluten free, fresh juices (extracted pure or blended) and wheatgrass shots. Casual layed back atmosphere and a lovely quiet space for eating, drinking, writing, texting, computing or just plan watching the happenings along Dewi Sita Street. 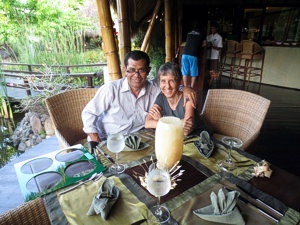 One of my favorite Ubud hangouts the fresh organic ingredients and varied menu offer me something any time of the day. In addition to their salads, sandwiches, burgers and entrees they offer several traditional indonesian dishes vegetarian style. Try the Jamu, a Balinese traditional tonic and one of daily favorites right here on the patio. I am also proud to say our More than a Nut Milk Bags are offered here. Another of the older established restaurants, Kafe offers numerous choices with their four page menu and fresh raw entree and dessert items daily. I have several favorites with Meg's salad at the top of the list. One of the local hangouts for the Yoga Barn crowd, there are always talkative guests there so meeting new friends and getting your questions answered is easy at this well established busy locale. 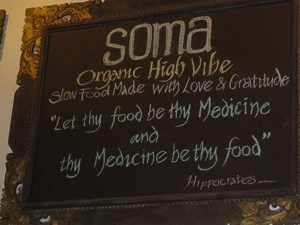 thy medicine be thy food"
One of the new kids on the block, also on Dewi Sita they describe themselves as "Organic High Vibe Slow food made with love and gratitude." 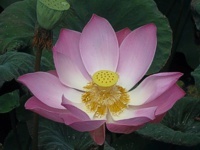 A new find this time and very popular with the yoga crowd. Small with only 5 tables and fun to share getting to know other traveling souls. With the Hippocrates Quote on the wall I knew I'd found a menut worth exploring. Having just eaten I perused the menu choosing the antioxidant blast smoothie (blue, black and strawberries, black currant and raw cacao) and loved it. Sweet but not too and blended well to incorporate the cacao nibs. A menu complete with waters including spring water -- first time I've ever seen that offered on a menu. Juices, elixirs, smoothies and lassies. I was thrilled to see such locally available ingredients like cinnamon, cardamon and clove, change your standard smoothie into something exotic. Jamu ( a local root), turmeric (great for immune building) daikon, kaffir lime and kencur (an aromatic ginger) were plentiful. With names like Om Omega, Mayan Magik, Belly Love and Groundation, there's lots to choose from and exciting tastes to explore. And that was before I got to the food part of the menu. A full breakfast, soup, salad, entree and small plate menu finishes with 'sweet treats that nourish body and soul' -- vegan desserts tradional and home made. A sweet cafe offering something for everyone with an added bonus of a half page description on the menu of "what is raw food." In September 2014 the café moved to their new home just around the corner on Jalan Dewi Sita. A beautiful space complete with garden courtyard, juice bar and upstairs shop. Same wonderful people, great music, amazing food and lots of room to play. I'm sure there are more and new ones coming every month. Always something to try next time and I can't wait for a new eating adventure in a community which takes their healthy food seriously, very seriously.